Eclectic Educating: The Power of Interactive Writing! The Power of Interactive Writing! These past couple of weeks I have been incorporating an often neglected strategy into my intervention groups...interactive writing! In interactive writing, the teacher shares the pen with the students, and they compose the text together. Students are involved in the process of deciding what to write, how to write it, and the actual writing of the piece. The video above is a great example of an interactive writing lesson. It was produced by the New Jersey Department of Education. The teacher does a wonderful job of sharing the pen with the students. Through this process, she is really able to reinforce a variety of phonics concepts as well as concepts of print. I was inspired to incorporate more interactive writing into my intervention groups. 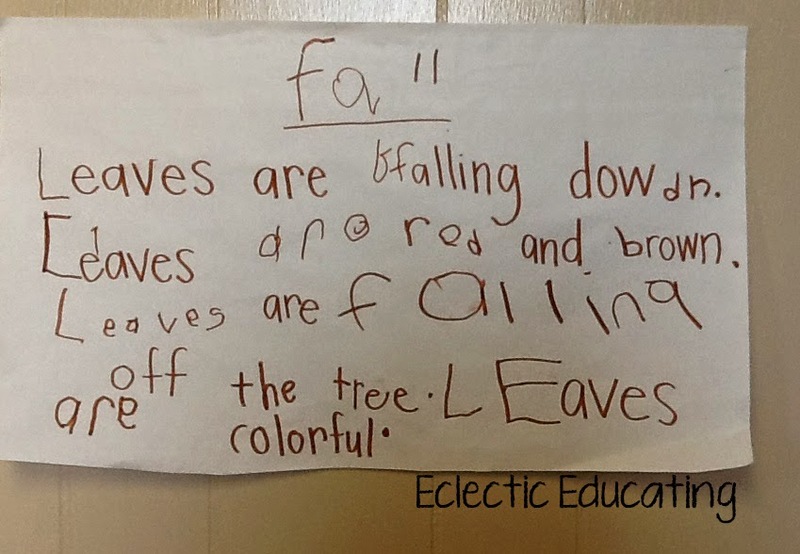 My kindergarten students composed a message about Fall. It was in response to a poem we read through shared reading. This message was actually written by all three of my groups. Each group decided what they wanted to contribute. The title was added by the last group. My first group is the lowest. They wrote the first two sentences. You can see that we wrote the words together. They often made the first letter or last letter, since those are skills we are working on. Then, my other groups attempted to write entire words by themselves. This was our first piece, and we still have some work to do. The students were extremely excited about getting a chance to write. They were all desperate for a turn! 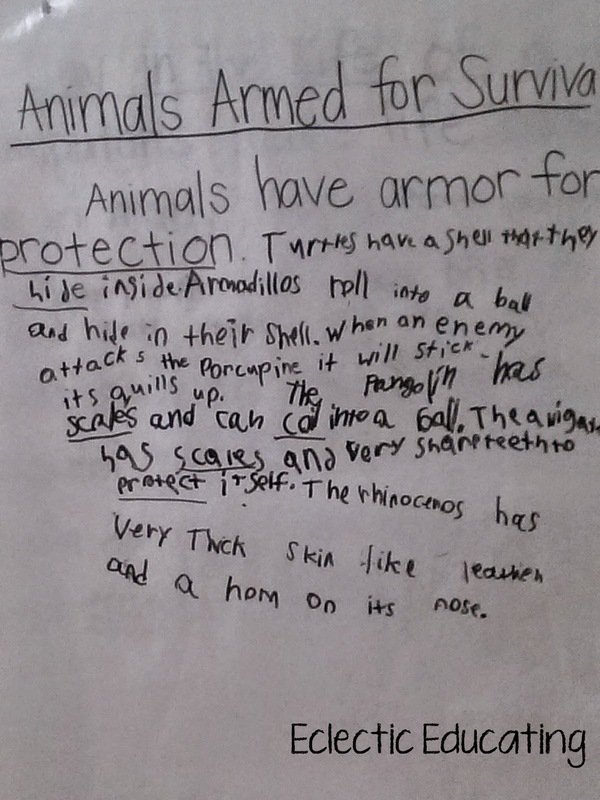 I also tried interactive writing with my third graders. I used a laminated piece of chart paper so that it was easy to correct our mistakes We wrote a nonfiction summary together. I wrote the main idea, and they wrote the supporting details. While we were focusing on the skill of summarizing, this also provided a great opportunity to review phonics skills, capitals, and punctuation. I was surprised how many times they forgot their capitals and periods! I was also surprised how excited they were to be participating in the actual writing. I know many teachers feel this takes up too much time with the older students, but I believe it was a valuable experience. While one student was writing, the other students were writing in their reader's notebooks. There was never any down time. Students were always engaged. They also couldn't wait to get their hands on that dry erase marker! They kept commenting on how they were "playing teacher." While it took more time than just writing students' ideas myself, the payoff was well worth it! How do you incorporate interactive writing into your teaching? That's a great strategy! I've done something similar with shared story writing, where each student adds a sentence to the story. I've never done it as a response or summary...hmmm..something to think about! Where did you find the interactive writing video? The NJ Department of Education used to have the entire lesson online, but I haven't been able to find it in years. Hi Katy! The Department of Ed did take down the videos, unfortunately. My supervisor used to work for the department and had me edit the video to share on Youtube. I edited out the woman speaking between the segments and kept the actual teaching portions. Well explained article about interactive writing.Thank you so much for sharing this article. Very interesting topic.Thank you so much for sharing this information.